Not much activity can happen during the winter at the Cathedral of Trees because of the weather conditions, apart that is from maintenance of the drains, especially after heavy rainfall. However, much has been going on all around in the woodland area. The conifers have been felled and light has now flooded into the site opening up the possibility of new growth and regeneration as well as spectacular views of Ben Cruachan and the surrounding hills. With the drains and paths restored and shady areas brought into sunlight, we can focus this year on the replanting of the site. Replanting of the woodlands with native broad leaves is also due to happen soon - the first step on the recreation of the area as a place of rich biodiversity which can be enjoyed by present and future generations. Visitors to the Cathedral of Trees have often asked for a translation of the Greek text on the gravestone on the left side of the altar. Sadly, we haven't been able to provide one. However, earlier this summer a kind friend, Colin Heber-Percy, (a very modest ancient Greek scholar!) came to our help. On a rainy day, he copied down the script, did a bit of research and discovered the origin of the quotation . It is from a piece by Callimachus (310-240BC) and it is his epigram addressed to his dear friend Heracleitus. Here is a translation with the words from the gravestone in capitals. "One told me, Heracleitus, of thy death and brought me to tears. I remembered how often we two in talking put the sun to rest. Thou, methinks Halicarnasian friend, art ashes long and long ago; BUT THY NIGHTINGALES STILL LIVE whereon Hades, snatcher of all things, shall not lay his hand". April and May have seen a lot of activity in the Cathedral. This is the first serious phase of the restoration programme and it involved repairing and improving the drainage system and paths. Over the years, the original drains had collapsed and this in turn caused die back in the trees and a general deterioration in the well being of the site. The paths were eroded by water and winter frosts and covered in weeds. The work involved digging out the old drains and clearing them of silt and debris and scraping away at the surface of the paths. There were some very large stones to be removed as well! New drainage ditches have been dug along either side of the central aisle - that's about 90 metres times 2 - and these have been infilled to form French drains. Soil and grit has then been placed on the surrounding grass to raise the level and further improved drainage. We are now looking for volunteers to rake this down in readiness for replanting. 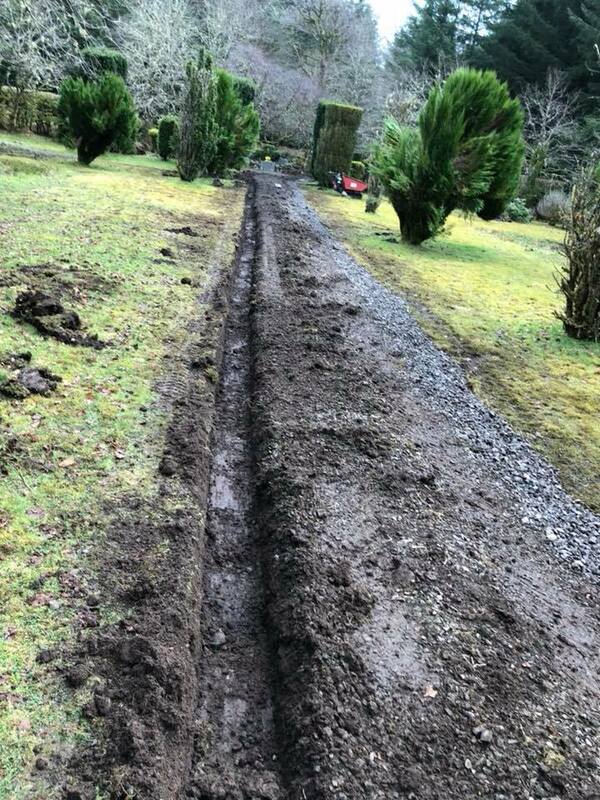 Grateful thanks go to Ian McCuish Landscaping for doing the work, to HISTORIC ENVIRONMENT SCOTLAND for being our main funder and also to The AVIVA Community Fund and those who voted for us for a grant of £1000. It's a pretty exciting time in the Cathedral this week as Ian McCuish and his team of expert landscapers have reinstated the drainage at the Cathedral. This is a crucial piece of work that will allow the replanting to begin. The ground has always been boggy but in recent years the drainage was almost completely blocked.